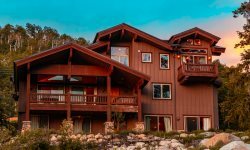 Monte Vista is one of the largest vacation rental homes at Solitude Ski Resort. Monte Vista includes 4 bedrooms, 4.5 bathrooms, a large living room, a game room with bar/mini kitchen, private hot tub on covered deck, gear/mudroom, two laundry rooms and a heated, two car garage. Guests at Monte Vista will have access to Club Solitude with heated pool, hot tub, exercise room and game rooms. Monte Vista is approximately 350 yards to the lifts. Monte Vista is a luxury, three bedroom home that can sleep up to 16 guests. There are two living rooms with comfortable, leather furniture for relaxing and watching TV. The gourmet kitchen is fully equipped with a gas stove, granite counters, all the appliances needed. The den includes a pool table, a bar and mini-kitchen. There are three spacious bedrooms. The master bedroom includes one king-sized mattress, a twin sized bunk bed and a private fireplace. The second bedroom has two queen-sized mattresses and a private bathroom with a shower-tub combination. The third bedroom has two bunk beds with queen-sized mattresses on bottom and twins on top. Downstairs in the basement there is a full futon and full bath.